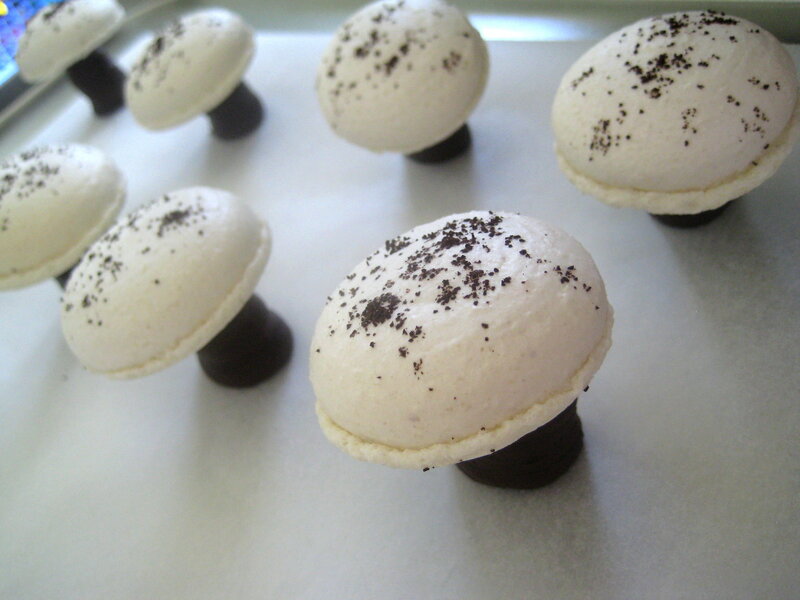 Mushroom macarons, now that you've seen them I bet your wondering why you didn't think of it first. It's just so deliciously obvious isn't it. Well it was to me while I was making my mediocre mocha macarons a couple of weeks ago. It's like an obsession for me, I see something and immediately I think of at least 10 different things to cook that I write down in my little ideas book. If only I had the time to bake everyday I might be able to make a dint in all those ideas, but luckily for me and you I did get around to making these macaron mushrooms and they are amazing. These mushrooms taste even better than they look, the base is a coffee ganache, creamy dark chocolate with a hint of coffee and the top is french almond macaron, a crisp outer shell and meltingly delicious center topped with bitter coffee grounds. A treat for your mouth with contrasting sweet and bitter tastes and crisp and creamy textures. I also made a white chocolate version which is just as yummy and I really like the colour of the ganache 'stem'. 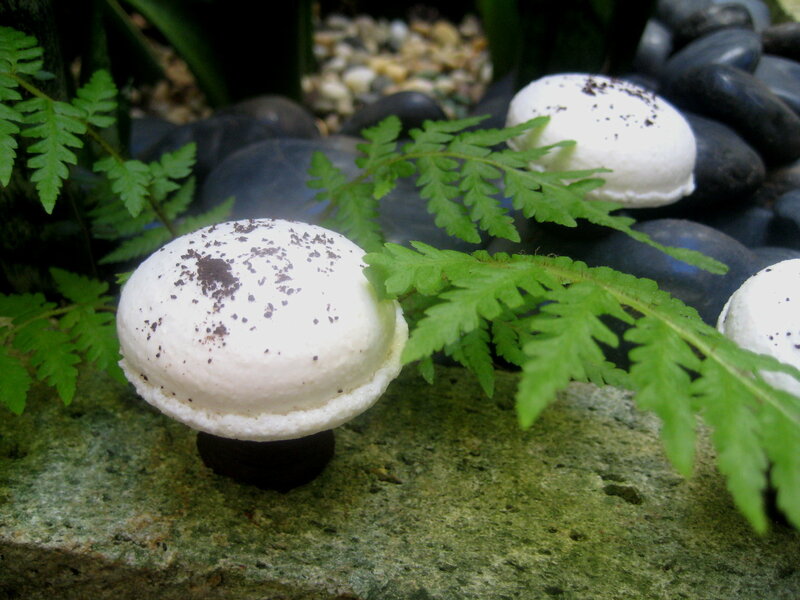 I've decided these coffee macaron mushrooms are one of my favourite coffee recipes and have submitted it to Not Quite Nigella's win a Nespresso machine You should pop over and have a look if you are in dire need of a new coffee machine like me. 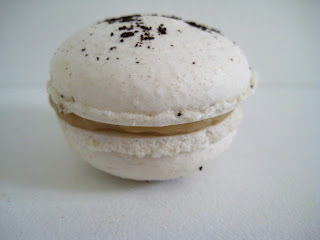 Of course the macarons and coffee ganache from this recipe can also be used to make traditional macarons as well. 1. Mix the ground almonds and icing sugar together and pulse a few times in food processor to make almond meal finer. Do not over process as the meal can become oily. Sieve into a large bowl. 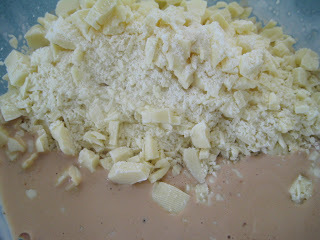 Add 55g (1 7/8ounce) of the egg whites to the sugar/almond mixture but don’t mix in. 2. Place remaining 55g (1 7/8 ounce) of egg whites in bowl of mixer fitted with the whisk. 3. Pop granulated sugar and water into saucepan stir to combine and cook without stirring to 118C. Once the mixture reaches 115C start mixing the egg whites on high. 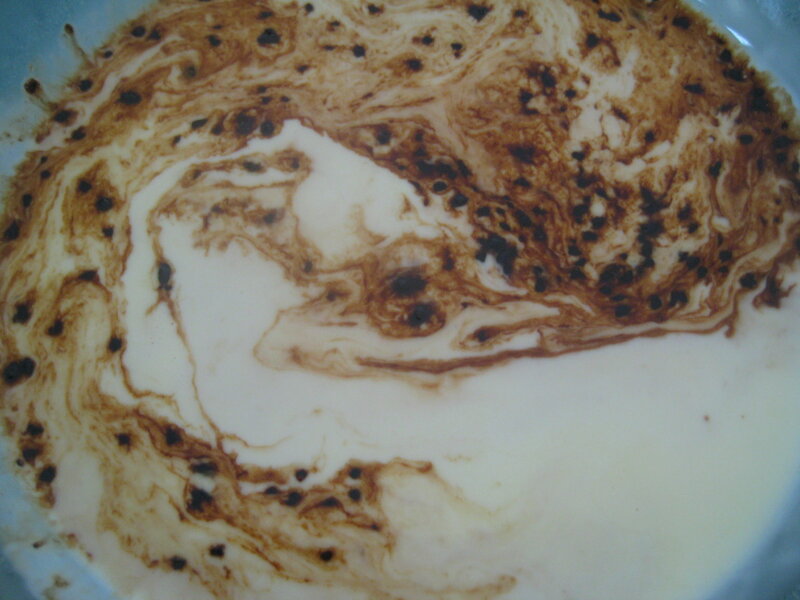 Once the sugar syrup reaches 118C remove from heat and immediately pour in a thin stream down the side of the mixer bowl continuing to whisk on high. 4. Continue to whisk the meringue on high until the side of the bowl is only a little warm to touch, around 50C. 5. Add meringue mixture to almond mixture and using a large spatula fold the mixture together until it starts to shine and forms a ribbon that stays visible for about 30 seconds. 6. Add the mixture to a piping bag fitted with a plain tip and pipe in lines onto parchment lined baking sheets. To make the macarons as even as possible I apply a constant slow pressure to the piping bag and count a few numbers like up to 3 for each one. Sprinkle a little ground coffee onto the top of half of each macaron. 7. Set aside for about 30 minutes or until the macarons have formed a skin that doesn't stick to your finger. Bring cream to boil, add coffee and stir until dissolved, pour mixture over finely chopped chocolate and stand 5 mins. Stir until all chocolate has melted. Allow ganache to almost set. Place ganache into a disposable piping bag and cut across to make an opening approx 1.5 cm or 1/2 inch across. Line a baking tray with parchment paper. 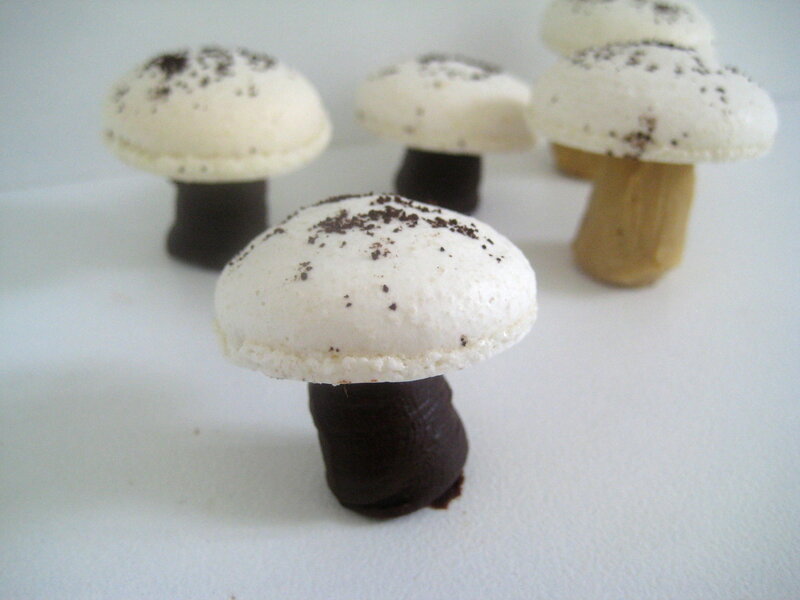 Pipe enough mushroom stems for each macaron leaving enough space between stems for macarons. 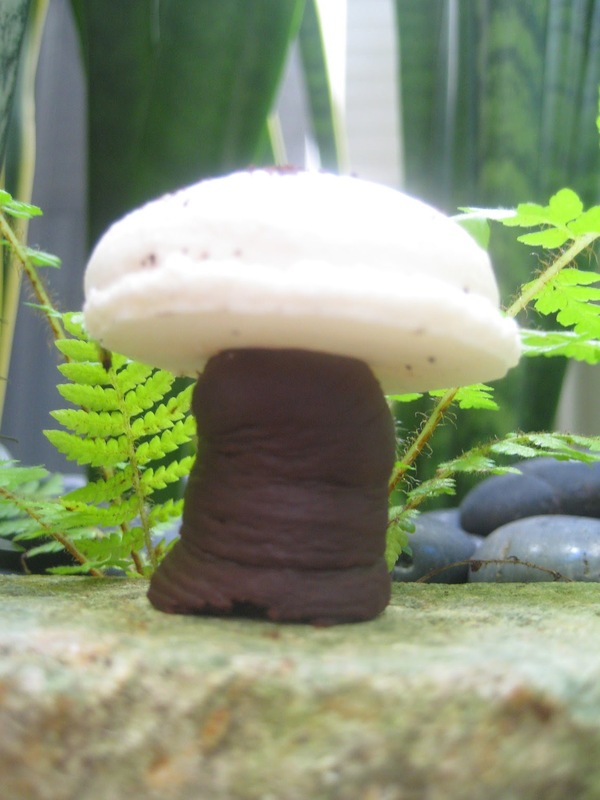 Allow ganache to set for a while and then top each stem with a macaron. 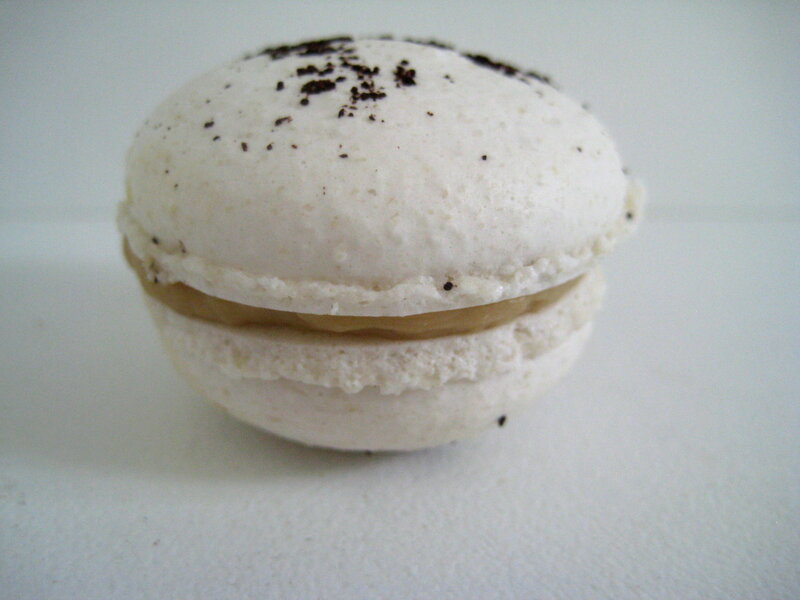 To help adhere macaron you may need to pipe a small amount of ganache directly onto the macaron to use as a 'glue'. 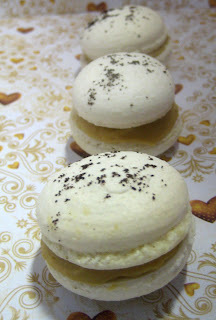 Don't press down too hard or the stem will break through the macarons thin delicate shell. Pop tray into refrigerator until set and remove from tray with a small offset spatula. Remove from refrigerator and allow to return to room temperature prior to serving. What a great entry for the competition Linda! :) They look totally adorable and I like how you styled them in your garden! Good luck in the comp I hope you win. im getting a nespresso machine tomorrow!!! Aren't you clever?! These are adorable, well done.